Conceptual models explaining the characteristics of ignimbrites and their basal deposits have mainly focused on variations in particle concentration and speed of the parent pyroclastic currents. Here, we focus on the effects of relative proportions of clasts that are well coupled to the carrier gas phase and those that are poorly coupled, i.e., the proportions of fine and/or low-density clasts compared to coarse and/or dense clasts. We document facies and macroscopic clast populations of two ignimbrite-producing eruptive sequences of similar volume and composition, both erupted from Latera caldera (central Italy). The Sovana ignimbrite has 1–15 vol% dense lithic clasts and locally up to 70 vol% in lithic-rich domains. It preserves evidence of emplacement of multiple overlapping flow units with local internal channeling. The ignimbrite is underlain by two basal deposits: (1) a radially distributed, 20–80-cm-thick vitric tuff referred to as BUS (basal unit Sovana) that thins gradually with distance and shows evidence of emplacement by lateral currents; and (2) a fines-depleted, lenticular, massive lapilli tuff, up to 20 cm thick, with abundant lithic clasts. The Sorano ignimbrite, in contrast, has < 1 vol% dense lithic clasts. It contains multiple reverse coarse-tail graded emplacement units, but we observed no internal channeling. In most places, its basal deposits are 20–100 cm of dominantly planar-parallel, 5–10 cm-thick, reverse coarse-tail graded tuff beds. However, in local depressions near the tops of paleocanyons that were filled by Sorano ignimbrite, the basal deposits are up to 2 m thick and are clearly cross stratified. We interpret the different deposit characteristics in terms of recent modeling and experimental results. The Sovana eruption involved major caldera collapse that introduced abundant dense lithic clasts into the erupting mixtures. BUS may have partly resulted from expulsion of a dilute, fine-grained mixture at the site where the pyroclastic fountain(s) impacted the ground, which then propagated outward as a dilute pyroclastic current ahead of the main ignimbrite-producing currents; the expulsion process is promoted by collapsing mixtures rich in poorly coupled clasts. The fines-depleted layer overlying BUS was deposited by rapid sedimentation of abundant dense clasts from the head of the ash-cloud surge, which accompanied the concentrated underflow that deposited the ignimbrite. Spatial and temporal variations in dense-clast abundance, and likely other parameters, during eruption resulted in multiple flow units. The Sorano eruption lacked poorly coupled clasts and did not produce an expulsion-driven current. Its ash-cloud head deposited ash and small pumice lapilli that were able to move in traction carpets prior to being overridden by a concentrated underflow. The overriding ash-cloud bodies locally deposited cross-stratified horizons in depressions high on the canyon walls, before they were inundated as the concentrated underflows filled the canyons with ignimbrite. To summarize, the differences between the ignimbrites and their basal deposits can be largely attributed to the differences in proportions of poorly coupled relative to well-coupled particles in the collapsing eruptive mixtures; the resulting conceptual model simplifies the previous range of interpretations for basal deposits, and is consistent with recent modeling and experimental results. The online version of this article ( https://doi.org/10.1007/s00445-019-1288-7) contains supplementary material, which is available to authorized users. We thank Dr. Andrew Harp for assistance in the field, and La Voltarella for ongoing logistical support. Brittany Brand and Tim Druitt provided very helpful reviews of the manuscript, as did Associate Editor Gert Lube. Computations were conducted at the University at Buffalo’s Center for Computational Research. This research is supported by a grant from the US National Science Foundation to Valentine (EAR-1623793). This Appendix provides a quantitative definition of the Stokes number, St, and briefly discusses complicating factors that provide the rationale for its use in a qualitative, rather than quantitative, sense in the main paper. where ρp, ρf, dp, and μf are the particle density, fluid density, particle diameter, and fluid viscosity, respectively, in Eq. 1. In Eq. 2 δf is a length scale for a characteristic fluid velocity change, and Δuf is the change in velocity of the fluid. The parameters in Eq. 2 depend upon the process of interest. For example, Burgisser and Bergantz (2002) define them in terms of characteristic eddy velocity fluctuations and length scales, which is appropriate for particle transport in a turbulent fluid. Sweeney and Valentine (2017) focus on the process associated with the impact of collapsing mixtures, so that the length scale was related to the vertical distance over which the vertical velocity component goes to zero as a flow moves toward impact, and the velocity change equals the speed of the falling mixture. Thus, St depends upon the flow dynamics of interest from the perspective of τf. 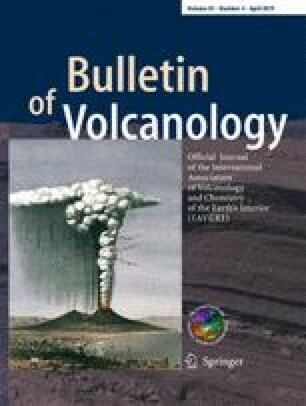 For the pyroclastic currents that produced the Sovana and Sorano ignimbrites, flow regimes ranged from impacting (collapsing) flow to turbulent to flow in a concentrated dispersion. Further complicating St are the effects of interparticle processes on τp as expressed in Eq. 1. In the simplest case, that of a particle in a dilute dusty gas, a given particle “feels” a fluid that is a mixture of small (well-coupled) particles and the carrier fluid, and this has a different effective density and viscosity compared to the gas itself (see Valentine and Sweeney, 2018, for quantitative expressions for this case). In pyroclastic currents, particle concentrations range from dilute, which is appropriate for a dusty-gas approximation (Marble 1970), to concentrations of tens of percent. At higher concentrations the effects of interparticle processes on τp become stronger and more complex. Because the parent pyroclastic currents for Sovana and Sorano ignimbrites were quite complex, involving a range of flow regimes and particle concentrations that are poorly constrained in a quantitative sense, we simply use St in a relative, qualitative way for poorly coupled versus well-coupled particles (i.e., large, dense particles such as lithic clasts versus small and/or low-density clasts such as ash and small pumice).